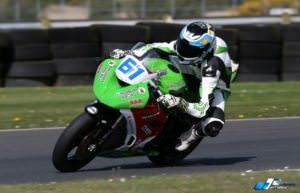 Manx-Man Dan Kneen’s name joins a who’s who of well known riders on the Prestigeous Enkalon Cup. After setting pole on in the mornings qualifying he lifted the coveted trophy winning both of the feature races. 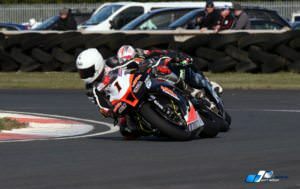 Race one he led from the off on his DTR S1000RR BMW taking the flag 1.6 seconds in front of local men Gerard Kinghan on his Kawasaki ZX10 and Ali Kirk , AKR/McCurry Motorsport BMW who finished 3.6 seconds behind the winner. The first attempt at race two was stopped after a red flag incident. On the restart it was South African Hudson Kennaugh on a Ryan Farquhar prepared KMR Kawasaki ZX10 who hit the front of the 4 lap sprint to the flag. 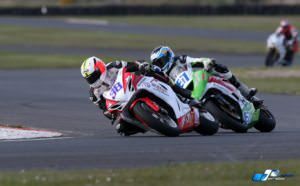 Not making the podium in the first leg he was determined to make amends and managed to hold Kneen at bay crossing the line with only 0.2 seconds of a gap to Kneen, Gerard Kinghan taking his second podium of the day. With a win and a second place finish it was Kneen who had the points to lift the silverware and the cheque for a £1000. 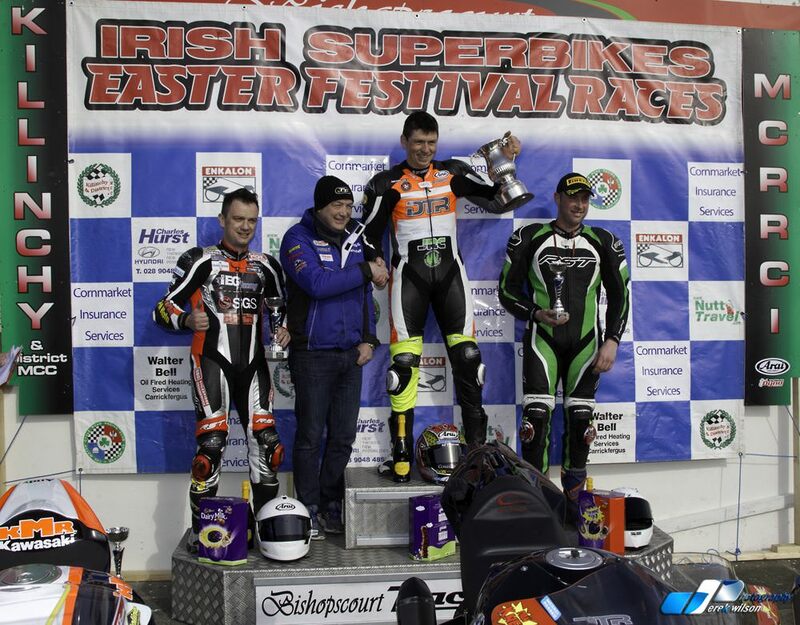 In the Supersport class reigning Irish and Ulster Supersport Champion Jason Lynn wanted to make up for his disappointment in the first leg of the Enkalon Races where he crashed out who threw down the gauntlet in race one winning on his Walter Bell Suzuki by almost four seconds from Christian Elkin Bob Wylie Kawasaki and Kori McGreevey Century Racing By IMR Triumph. Race two wasn’t to be such a straight forward affair for Lynn. Ross Patterson took the lead from the start with Lynn tight on his tail, the pair never separated by more than a bikes lenghth throughout most of the nine lap race, Lynn took the lead in the closing laps but missed a gear going into the final chicane giving the front spot back to Patterson who held on to take the victory by 0.3 seconds with Aaron Armstrong taking the final step on the podium. 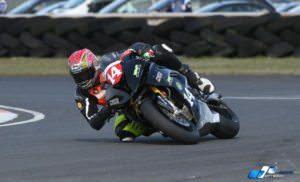 Mark Hanna won both the Supertwin races, race one he and Joseph Loughlin had a close fought race before Loughlin crashed out handing second place Hudson Kennaugh and third to Cathal Graham. 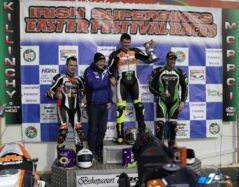 Race two Marty Lennon was second and Cathel Graham third..